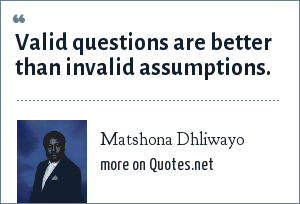 Matshona Dhliwayo: Valid questions are better than invalid assumptions. Valid questions are better than invalid assumptions. Matshona Dhliwayo is a Canadian based Philosopher, Entrepreneur, and author of books such as The Art of Winning, The Little Book of Inspiration, 100 Lessons Every Great Man Wants You to Know, Dinner with King Solomon and Lalibela's Wise Man. He is a regular contributor for The African Leadership Magazine, The CEO Magazine, Health Magazine, and other internationally renowned magazines. "Matshona Dhliwayo Quotes." Quotes.net. STANDS4 LLC, 2019. Web. 25 Apr. 2019. <https://www.quotes.net/quote/65129>.